We found this utterly charming picture book at the library a year or two ago, and my younger daughter loves it. She just checked it out again, which prompted me to post about it. It is the story of a little girl who loves to read. One night, a ghost comes to steal her book, and since she doesn’t let go, she goes with the ghost, too. 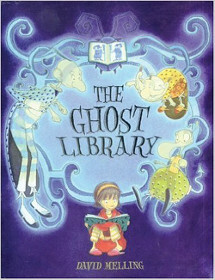 She finds herself in the ghost library, which is completely empty. The little girl reads the ghosts a story, and then teaches them how to tell their own stories. It is really a delightful story. I suspect that it might be helpful for kids who are worried about ghosts and such at bedtime, since the ghosts in this book are all quite nice, and a visit to the ghost library sounds like a wonderful adventure, not something scary. The book seems to be out of print, but Amazon has some used copies for sale- and of course, you can always check your library! It is worth the effort to find.